When I ask new or potential clients about reviewing their financial situation, the standard answer is: “I have a plan.” But what they really have is a bunch of “stuff”: an IRA, an insurance policy, maybe a will and trust, and a pile of other things depending on their level of financial wealth and complexity. There’s no master plan guiding the details around all these pieces. It’s the equivalent of setting carpenters, plumbers, and concrete contractors loose on a plot of land and hoping they’ll finish with a dream house. What is missing is a financial blueprint. Why Is There No Blueprint? Most of the time it has to do with not hiring someone who’s an expert in financial planning. Many people have a stock broker, an insurance agent, an attorney, and an accountant (or are serving some version of these roles themselves). Those professionals have successfully helped create the things they work with. So, the client walks away with the components of a plan, but without coordination. Lack of coordination can lead to wasted opportunities, inadequate resources for your family, unnecessary taxation of assets or insurance, and simply a plan that doesn’t meet your objectives. A product is not a plan. 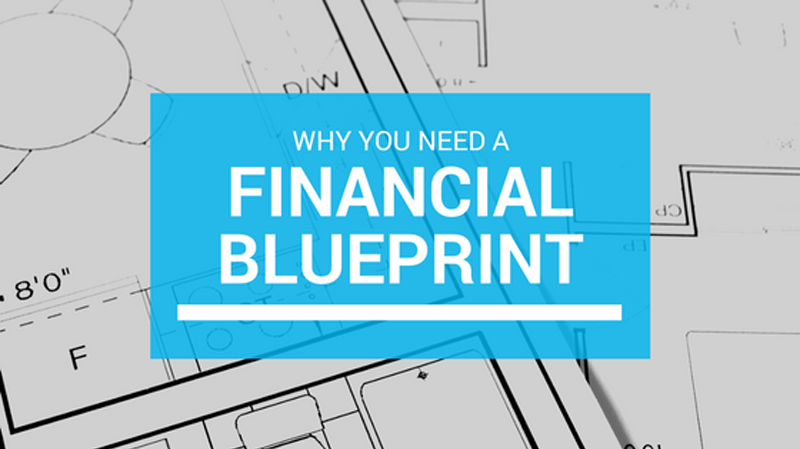 You may have an IRA, an insurance policy, a will, etc., but do you have a financial blueprint to coordinate everything? Whether you work with an advisor or you do the work yourself, your plan should start with your objectives. What are you trying to accomplish? What would you like to provide your family in the event that you live too long, die to soon, or become disabled along the way? Without clear, written objectives, you won’t have a plan that can work toward your specific needs any more than you could build your dream home without a blueprint. I/We would like to be able to retire/be financially independent at age _____. Meaning we have $X of income until age X, factoring X% inflation. In the event that _____ should die prematurely, we would like to provide $X of income to maintain the other partner’s standard of living for X years and provide the following expenses for the children: $X, $X, $X. As an advisor, sometimes the hardest thing for me to do is to help a client figure out what their goals are. Some things are easy and are just a matter of algebra. Take disability, for example. If you run a financial model of your income and expenses, and remove your income for the rest of your life, the model can show you what the shortage is. This helps answer the question, “Do I need disability?” The same process can be applied to life insurance and long-term care insurance. Retirement planning can be more difficult, because often people are so busy making a living now, that they haven’t really thought about what that future might look like. Or they’ve put it off because it seems like such an overwhelming task. Remember: Planning is a process, not a product. Start by taking the time to identify your financial objectives and life goals. Consider your values, your family, and other things that are important to you. Ultimately, the hope is to create a financial blueprint that will help you achieve your personal aspirations and leave behind the legacy you want. If you need help discovering your goals or building a cohesive financial blueprint, feel free to contact me. Email Carlo@IntegralWealth.net. There is no guarantee that a diversified portfolio will enhance overall returns or outperform a non-diversified portfolio. Diversification does not protect against market risk. This information is not intended to be a substitute for specific individualized tax or legal advice. We suggest that you discuss your specific situation with a qualified tax or legal advisor.